I have a wonderful cookbook called Entertaining with Friends and it was made by the Monroe Carell, Jr. Children’s Hospital at Vanderbilt, where I was a patient through college. It was a wonderful place that does great things for kids and families. I think a friend gave me the cookbook but honestly I can’t remember. I don’t know about anyone else, but I don’t do a great job of using my cookbooks. I usually have a couple of recipes from it that I make and then it gets put to the side and forgotten about. This is one my go-to recipes from this cookbook that I wanted to share. 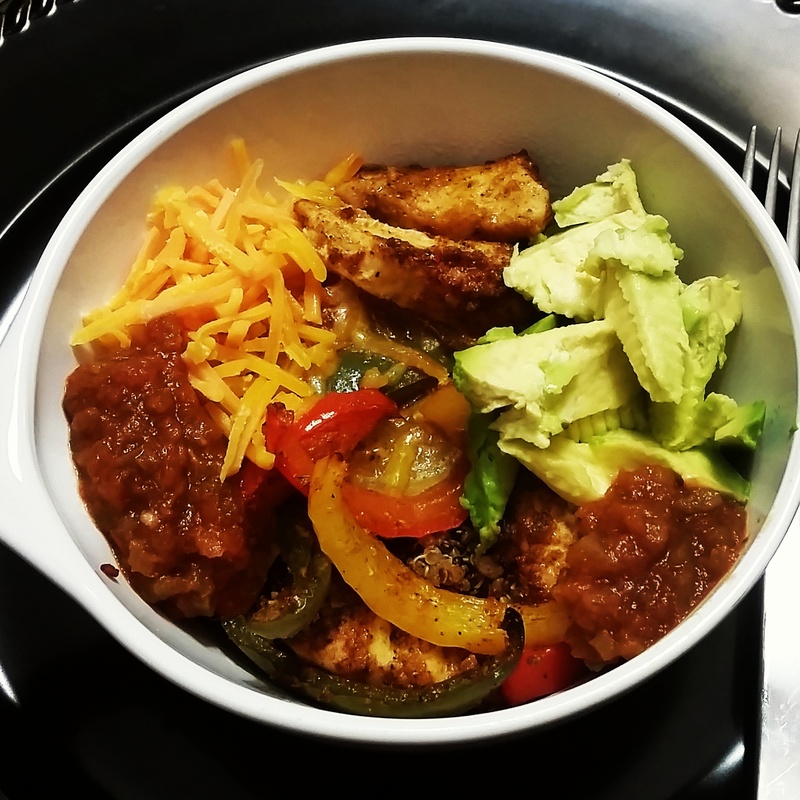 It’s a pretty easy recipe and we actually had everything we needed when I thought to make it recently. I remembered to take pictures a little late so they’re not quite as detailed as I usually like for recipe posts but you’ll get the idea! Start with your ingredients and some prep. Pound and season the chicken. I also cut the breasts in half. Chop the onion and quarter the mushrooms. We accidentally chopped the mushrooms because the recipe right next to this one requires chopped mushrooms. But it’s still mushrooms all the same! Briefly sauté the chicken then place in a baking dish. Sprinkle the cheese on top of the chicken. Then make the sauce in the same pan, adding each ingredient and letting it cook. First the onion, then mushrooms, then the wine and simmer. Pour the onion mixture over the chicken and bake! We also baked some delicious brussel sprouts with our go to recipe – salt, pepper, olive oil, and balsamic vinegar. Add a salad, bread, rice, whatever other sides you want! Pound the chicken to a uniform thickness. Sprinkle with salt, pepper, and garlic powder. Heat 1 ½ Tbsp. olive oil and 1 Tbsp. butter in a skillet. Add the chicken and sauté briefly. Remove to a baking dish. Melt the remaining 1 ½ Tbsp. olive oil and 1 Tbsp. butter in the same skillet. Add the onion and sauté until tender. Add the mushrooms and sauté until tender. Stir in the wine. Simmer for a few minutes. Sprinkle cheese on top of the chicken. Top with mushroom mixture. Bake for 30-45 minutes or until bubbly and the chicken is cooked through. Categories: Merry Monday | Tags: chicken, cooking, dinner, food, french boneless chicken, recipe | Permalink. This was a Home Chef delivery I got recently. It was a simple recipe that seemed to be easily modified, so I gave it a shot. It’s easy to make, very little prep, and has a pretty easy shopping list. All the amounts are estimates, so you can easily add more or less of something. Or you can completely change items (pasta type, specific vegetables, type of cheese). Home Chef recipes are for 2 servings, but pasta recipes usually make more than 2 for me. And my recreation fed me 4 meals. Full recipe below after an overview of steps and pictures. Enjoy! Pretty simple and easy to find ingredients. The original recipe called for cavatappi pasta, which my grocery store did not have. Easy to substitute your favorite pasta though! I used whole grain penne. Start water boiling for the pasta and prep your ingredients. Halve the tomatoes, cut zucchini into quarter-slices, trim asparagus and cut into 1 inch pieces, and drain the artichokes. Roughly crush a handful of croutons. Sear the vegetables. Start with asparagus and zucchini, then add tomatoes and artichokes. When pasta is cooked, drain, return to pot and toss with some olive oil. To make the sauce, heat evaporated milk until slightly thickened. Add Parmesan cheese and breadcrumbs. Remove from heat and add butter. Season with salt and pepper. Add everything to pan with sauce and toss! I added some chicken to mine. Serve with a sprinkle of Parmesan cheese and crumbled goat cheese (I totally forgot the goat cheese before I took pictures and dug in – sorry)! Start water to boil in a medium pot for pasta. Cook according to directions on box. Prep ingredients: halve grapes tomatoes; trim bottoms off asparagus and cut into 1 inch pieces; cut zucchini into half moons; drain artichokes; put croutons in a ziploc bag and crush into coarse breadcrumbs. Heat 2 tsp. olive oil in a large pan on medium-high heat. Add asparagus and zucchini and cook 4-5 minutes, stirring occasionally. Add grape tomatoes and artichokes and cook 2 more minutes. Transfer to a plate or bowl and set aside. When pasta is finished cooking, drain in colander, return to pot, and toss with 2 tsp. olive oil. Set aside. Return same large pan to medium heat. Add evaporated milk to hot pan and bring to a simmer. Cook 4-5 minutes or until slightly thickened, stirring often. Stir in Parmesan cheese and breadcrumbs. Cook 2-3 minutes or until sauce is thick enough to coat the back of a spoon, Remove pan from burner and swirl in butter. Season with salt and pepper. 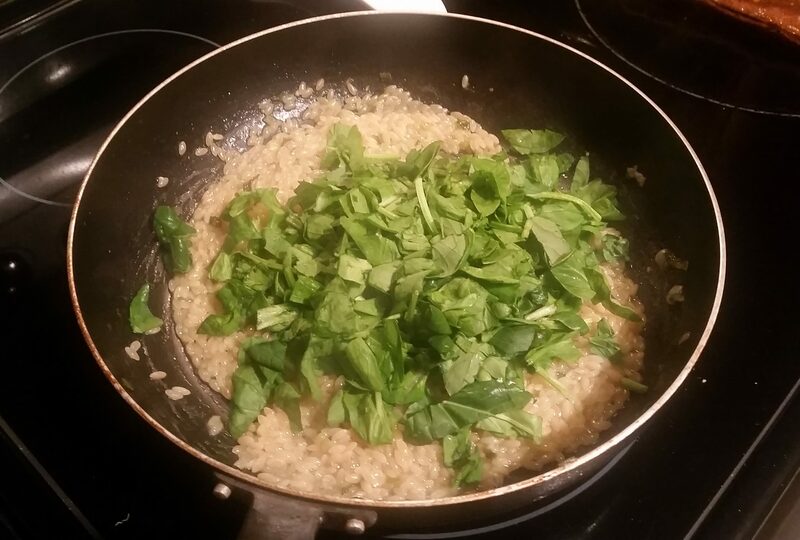 Add pasta and vegetables (and cooked protein if you have it) to pan with the sauce. Toss to coat everything in sauce. Serve topped with a sprinkle of Parmesan cheese and goat cheese crumbles. Categories: Wonderful Wednesday | Tags: cooking, food, Home Chef, pasta, recipe | Permalink. I got this recipe from my sister-in-law a long time ago and just rediscovered it in my recipe box. It is very easy and delicious – a great side to go with anything. You do want to make sure to prep everything before starting because it goes pretty quick once you start. And you kind of need to watch it closely, so I recommend making it when you have your main meat/dish cooking in the oven or someone around to help. This is a very basic recipe and would be easy to modify – add some different veggies, add some Parmesan, add some meat to make it a meal on it’s own – go crazy! You’ll want to go ahead and prep everything, including measuring out everything. Trust me, you will be glad you did. Chop your green onions and spinach. Measure out your liquids – use a glass measuring cup for the chicken broth as you will heat it up a little in the microwave before adding it. Time to cook! Heat the olive oil in a skillet. 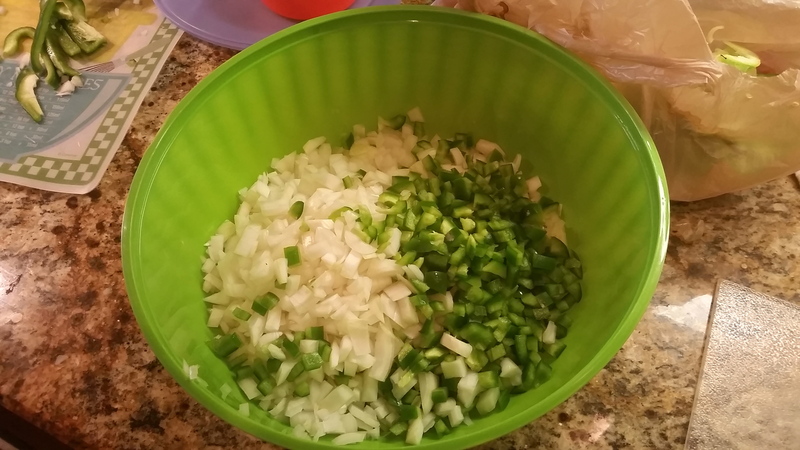 Add green onion, garlic, and orzo. Toast, stirring frequently, for about 3 minutes or until orzo has started to toast. Watch carefully or the orzo will burn. Add the white wine and stir until absorbed. While the white wine absorbs, stick the chicken broth in the microwave for 1-2 minutes to warm it up a bit. 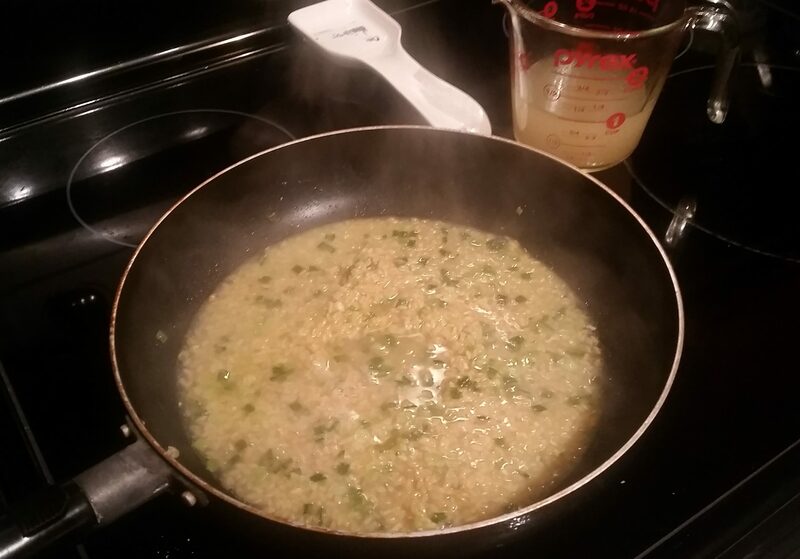 Add ½ a cup of chicken broth and cook, stirring frequently, until absorbed. Repeat 2 more times with ½ a cup of broth at a time until all is absorbed. Turn off heat and add chopped spinach until well incorporated and wilted. Season with salt and pepper and serve it up! 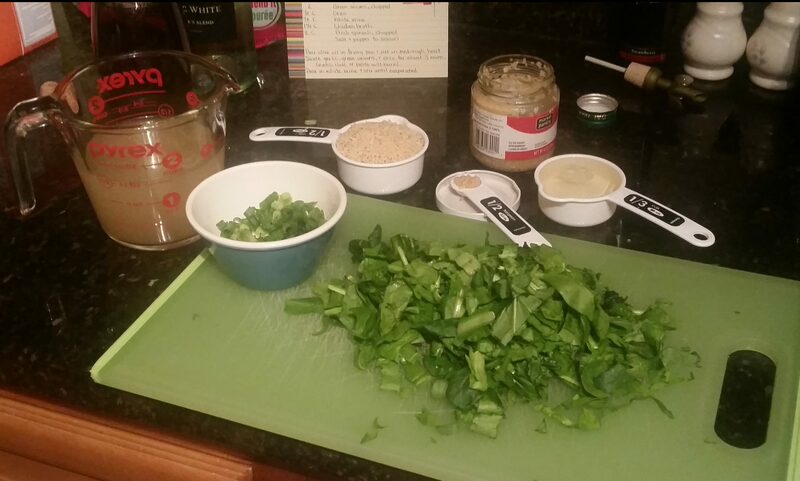 Prep all ingredients (chop and measure). Heat olive oil in a skillet over medium-high heat. 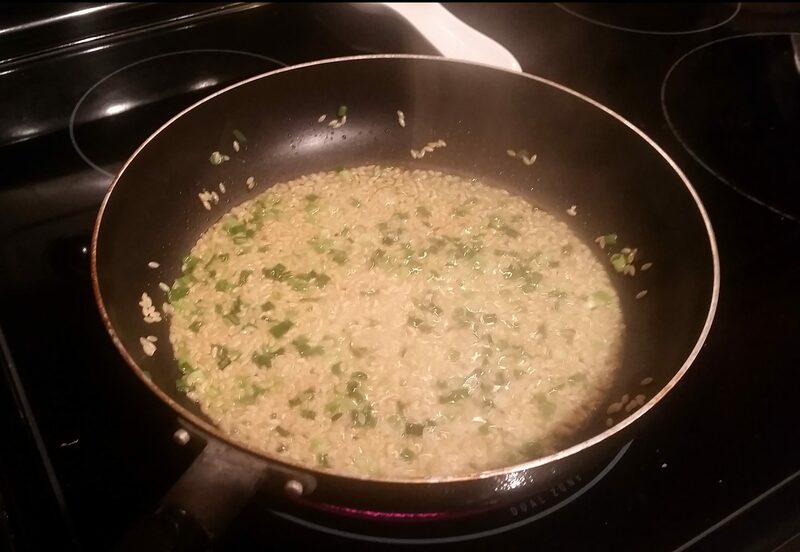 Add green onion, garlic, and orzo and cook for about 3 minutes or until orzo is slightly toasted, stirring frequently. Add wine and cook until absorbed, stirring frequently. While wine cooks down, heat chicken broth in microwave for 1-2 minutes (want it at least warm). Add ½ cup of chicken broth and cook until absorbed, stirring frequently. Repeat 2 more times with ½ cup of chicken broth each time until all broth is absorbed. Turn off heat and stir in chopped spinach until wilted and incorporated into the pasta. Categories: Merry Monday | Tags: cooking, food, orzo, pasta, recipe, side dish | Permalink. Although I visit Alabama regularly to see family, I realized I’ve never posted about it! Granted, a lot times we are just hanging out at home, which is totally fine, but we do some fun stuff too! My last trip down, we had some amazing food. My brother and sister-in-law live in Daphne, AL but her parents live in Fairhope and we spend a lot of time there as well. Especially because Fairhope has an adorable little downtown on the bay and has some great restaurants. That’s also where my last triathlon was a couple years ago! We had a kid-free dinner on Friday night at Camellia Cafe. Their website is down (and has been), so I apologize for not remembering everything we ordered (which was a lot), but it was all delicious. We started with beverages and appetizers (yes, multiple appetizers). My sister-in-law and I got a delicious drink (sorry, can’t remember what it was! ), though it was maybe a little sweet to have more than one. For appetizers we got fried green tomatoes and pot stickers (I can’t remember what was in the pot stickers – I think it was pork belly – but they were very good). My entree was amazing: pan seared duck breast served on polenta (I think it was cheesy) and asparagus. Saturday morning, we took a girls morning and went out for breakfast and errands. The Warehouse in Fairhope is my new favorite place. If you know me at all, you know that breakfast/brunch is my favorite meal, so that is saying something. They have a great menu, whether you want a quick coffee and donut, or to sit and enjoy a filling breakfast. I had chicken and waffles that were to die for. The chicken melted in my mouth and the whipped sriracha butter was a perfect little kick. Highly recommend. Oh and the cold brew coffee was also great – you can have it with milk, chocolate milk, almond milk – pretty much whatever your heart desires. Categories: Merry Monday | Tags: alabama, camellia cafe, Fairhope, food, restaurants, the warehouse, travel | Permalink. Over Memorial Day weekend (yes, this post is slightly delayed), my sister-in-law, her mom, and I prepared some freezer meals for a bunch of people. My dad is currently receiving chemo, so we figured having a variety of meal options to pull out of the freezer would just be one less thing for my mom to worry about! We kept some of each for ourselves too, which has made life a little easier for myself as well! Freezer meals are just a good idea all around. This was one my sis-in-law had from a coworker’s mother-in-law (trading recipes is the best!!) that I had never tried before and it was amazing – and really easy. Everyone loves meatloaf, but if you’re feeding just one or two people, you really don’t need a whole loaf of meat. So this recipe transforms that loaf into individual patties, so you can just pull out however many you want! And it uses oats instead of bread crumbs if you are avoiding breads. Just mix everything together and form into patties. 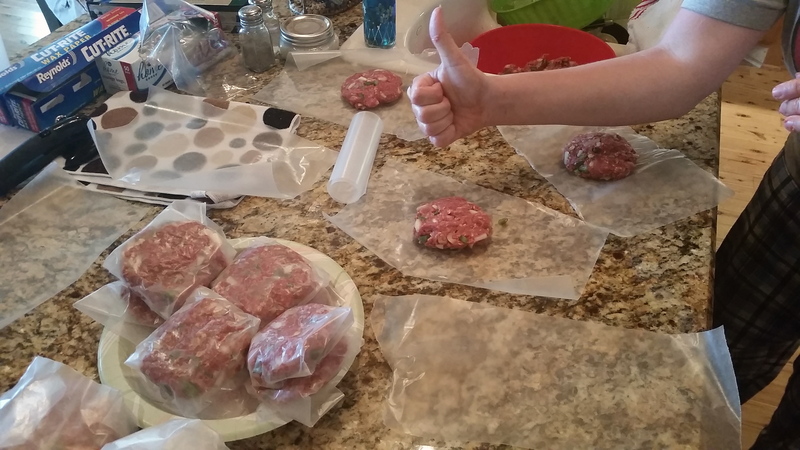 Cook right then or wrap in freezer paper and put in a freezer bag to store in the freezer! 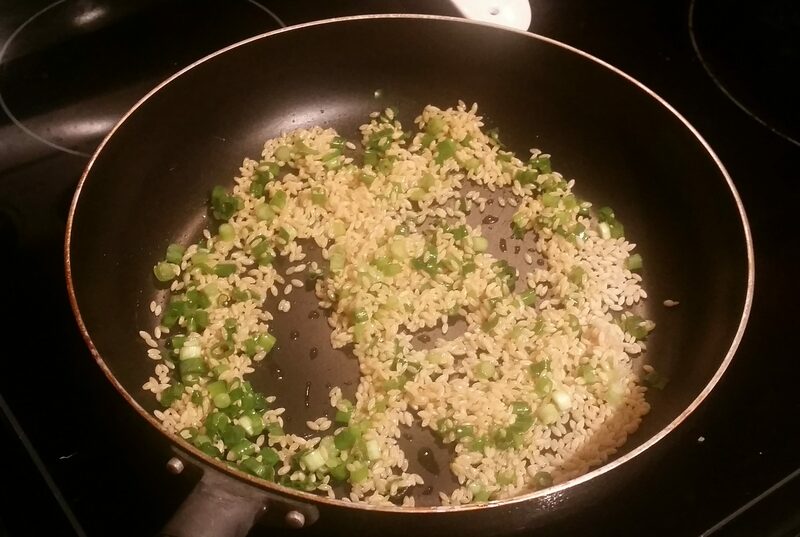 *optional extra step: saute onions and green peppers and cool before mixing everything together. I prefer this because the onion and green pepper was still a little crisp after cooking. that could be due to us chopping in larger pieces or making larger patties, but it’s definitely a personal preference! 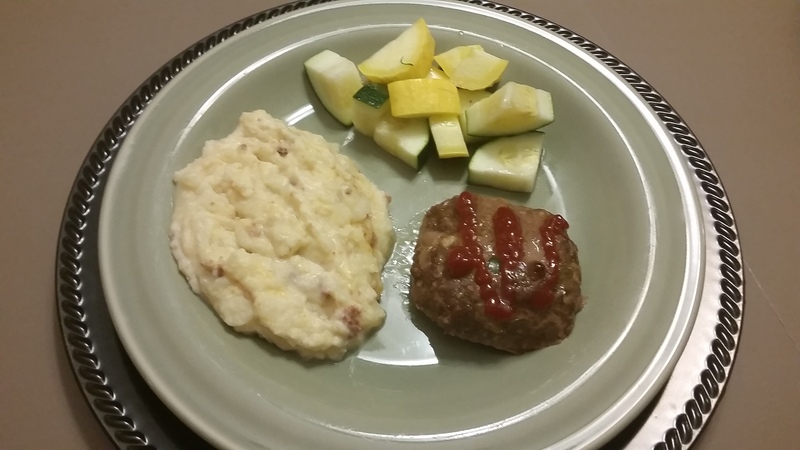 Categories: Wonderful Wednesday | Tags: cooking, food, freezer meal, meatloaf | Permalink. 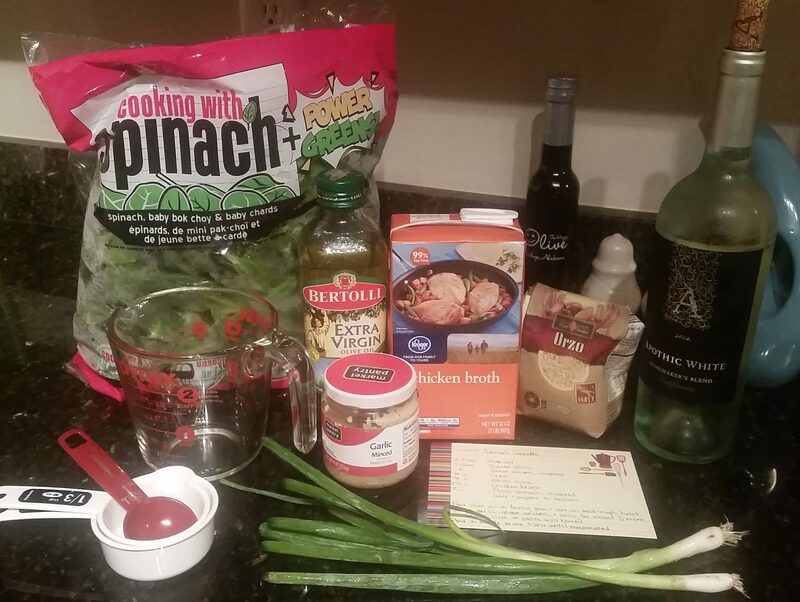 I tried out Plated recently, so of course I had to try another recipe delivery to compare! Home Chef popped up on my facebook ads and had a good promo, so I went with it! Same shipping, same packaging, almost identical recipe cards. Home Chef is cheaper per plate than Plated and the Home Chef meals seemed to be more filling (more meat options). For my first week I chose the Salvadoran Flat Iron Steak and Turkey and Goat Cheese Meatballs (over pesto spaghetti). They were both delicious, very filling, and the produce was fresh. The only downside was that there was not really 2 servings worth of cauliflower to go with the steak. Plated does have some more unique menu options, so that is a plus. Both are lovely options if you are like me and like to cook but don’t love grocery planning or shopping. I’ll keep trying them as long as I have some credits or discount codes to use! 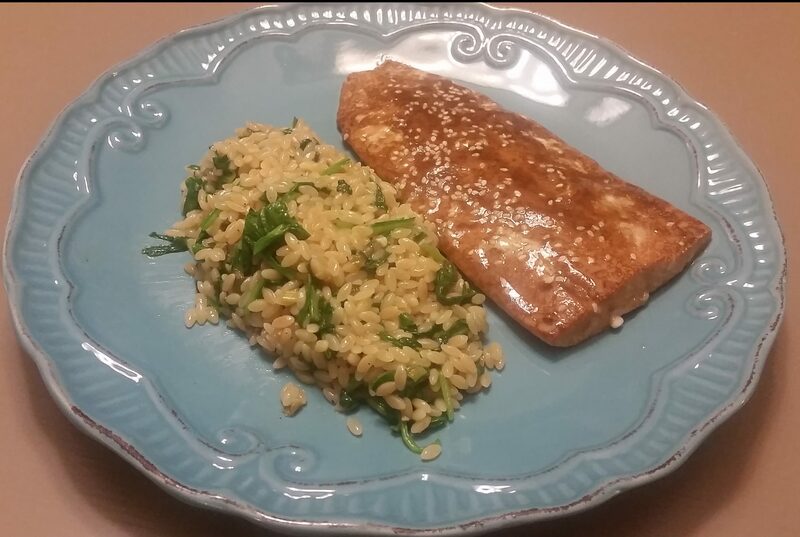 To try Home Chef with a $30 credit, use this link: https://www.homechef.com/invite/96Vlt94DRrg and let me know what you think! Categories: Merry Monday | Tags: cooking, food, Home Chef | Permalink.